I wrote a couple of days ago about a global ranking showing which nations enjoy the most personal and economic freedom. Surprisingly, European nations dominated the top 20, which suggests (given the depressing amount of statism in Europe) that libertarians have a lot of work to do if we want good liberty-oriented role models for the world. Heck, even the top three jurisdictions (Hong Kong, Switzerland, and New Zealand), while very admirable compared to most other nations, still have too much government. In the fight for libertarian policy, we face several obstacles, including the “public choice” pressure for ever-growing government, as well as the fact that we simply need to learn how to be more persuasive. And if we want to be more persuasive, we need to somehow convince people to apply sensible principles in a consistent manner. And this is why this Venn Diagram from Mark Perry’s collection is so valuable. It’s addressed to leftists and it challenges them to consistently apply their beliefs about the liberty of consenting adults. Mark obviously hopes that the people who think there should be freedom for personal relationships will realize that it is inconsistent to simultaneously want to restrict freedom in economic relationships (in this case, the freedom to accept a job that doesn’t pay as much as some politicians would prefer). But the Venn Diagram also could apply to conservatives by changing a few words. 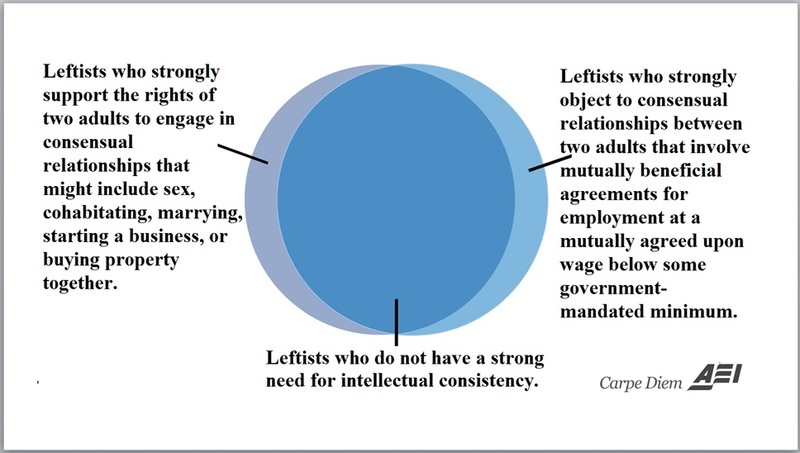 Folks on the right generally understand that consenting adults should be free to engage in voluntary economic exchange, but they sometimes want to limit consenting adults in the personal sphere. By the way, a belief in freedom doesn’t imply that people have to be happy about the choices others make. You can think that it’s wrong and sad and unfortunate that some people have very limited skills and are able to earn only $5 per hour in the marketplace. And you can you personally disapprove of certain relationships between consenting adults. Libertarianism is simply the principle and theory that you don’t support government coercion to prevent other adults from engaging in behaviors that you don’t like. Assuming, of course, that other people’s actions don’t conflict with your rights to life, liberty, and property. P.S. You can enjoy other Mark Perry Venn Diagrams here, here, here, and here (newly added). Consensual relationships should not be confused with Marriage. This hits another strong opinion point with me. The only reason many couples want to marry is because there is a potential legal/monetary benefit behind it. The government needs to get out of the game of placing tax benefits, healthcare benefits and legal rights on marriage. Take those away, the whole desire to be married only becomes one of religious conviction. The government insists on separation of church and state in most instances, and yet has now ordered that churches MUST marry certain people or face repercussions. Doesn’t sound much like separation to me.